Self-awareness is an emotional intelligence competency that gives us the ability to recognize and understand our own emotions and moods. It also helps us to differentiate and categorize emotions in others, as well as to understand emotional clues floating in our environment. Self-awareness helps us to realize important emotional factors around us; those factors that can and will trigger either a subtle emotion or a full-blown outburst. Emotional intelligence provides us with the awareness and skills that help us recognize and discriminate information that negatively impacts our behavior. This challenges our own social and professional performance. Remember, everything we do, and everything that someone else does, will always influence our cognitive and non-cognitive emotions. This will further dominate our thoughts and actions. Awareness is the ability to perceive facts as they occur. Awareness is the comprehension and consciousness of raw, naked information as it happens before our inner cognitive brain changes that information into something else. After it has been changed, we will only recognize the information based on our perception. We must never confuse perception with awareness because those are two different cognitive ways of processing information. If we, as human beings capable of controlling our future, could just for a second stop and ignore our innate automatic responses to the world around us, we would learn the meaning and significance of our emotions; what triggers them, the impact they have on us and others, as well as the impact they have in the way we write policies and regulations and make all sorts of management and leadership decisions. Understanding others’ emotions, as well as our own, is vital for a well-functioning society. Whether we realize it or not, our cognitive brain uses this understanding to make decisions. Knowing our emotions is one of many factors making us emotionally intelligent and emotionally different from most primates. 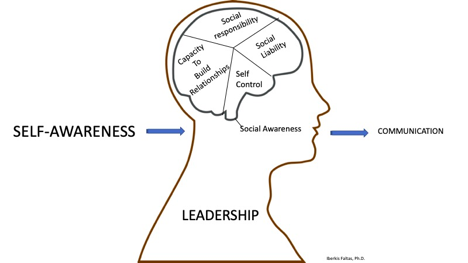 The processes of both learning and practicing self-awareness are only two steps in the wheel of abilities and skills linked to emotional intelligence. It takes just a few minutes a day to train our brains to learn self-awareness. Learning and practicing self-awareness is like everything else we do; the more we train, the more we learn and the better we become at recognizing our own and others’ emotions. Learning emotional intelligence can help us decode many intriguing behavioral puzzles about ourselves and others. • What or who is causing that feeling of discomfort? • Why do we feel the way we do? • What or who is causing those feelings? • Do we understand why we feel this way? • Do we know what to do next with those feelings? • How important is this information for our well-being? • How important is it to process and clarify those feelings before making our next decision? • How is this information influencing our actions? • Do we nurture this feeling of discomfort or do we face it and resolve the issue? Those questions become clearer as our understanding of emotional self-awareness increases. The need to understand emotional data is constantly swirling around us, not only in the workplace but everywhere we turn. Whether we want it to or not, emotional intelligence compounds feelings that form the foundation of our communication, relationships, decisions and overall way of dealing with people in general. Perhaps after learning self-awareness, we will learn to stop pointing fingers in all directions. This is not what public service is about. Public service is about the good of the people. It is about bettering our community and making the best choices to better our society. Otherwise, we are working in the wrong field.